Posted on Sun, May 5, 2013 : 6:30 a.m. The sun was shining, the grass was green, the river flowing. And as I walked along the beautiful western edge of Ypsilanti’s Water Street property on Wednesday, all I could think of was: What makes sense here? I’m not alone in that line of questioning. This property - 38 acres, assembled into a single parcel more than a decade ago - started as a vision for extending downtown. Homes, businesses and riverfront recreation all belonged there in that original plan. It was ambitious and defining, and it cost the city millions before evaporating. Developers couldn’t make the numbers work. The Great Recession descended upon Michigan. And Ypsilanti was left with a much larger than projected $30 million in debt on the acreage. As I stood near the southern edge of the property, I understood the complexity facing the city as it sought to determine that answer since the 1990s. The Huron River makes it feel purely like recreational land. Yet its northern edge borders US-12 and the visibility of that high-traffic corridor, creating tension between prospective building and enduring open space. That sense of “this or that” permeates every aspect of Water Street. The push to sell land and spur development. The urge to step back and plan what’s there. The sense that it’s a unique parcel, yet it’s not the only large tract available: There are expanses of vacant acreage along Factory Street and east at the township border for a developer looking for space. The willingness of Washtenaw County to build a recreation center there as a “first in” project. The rejection of it, as others say it shouldn’t be on that property at all or in a prominent spot. The years-long real estate listing as the city sets a priority for dense development. The renewed interest in master plan revisions amid calls for priority shift. The natural beauty. The contamination that awaits cleanup. The widespread marketing of commercial space. Community concerns over the two businesses that wanted to buy land: First, Burger King; now Family Dollar. I can’t disagree that Water Street presents a special opportunity to the city of Ypsilanti. And that’s why I walked the property. I spent years driving past it; before that, I spent years working in one of the buildings demolished to clear its way. And in all of those years working there, I had no idea of the natural beauty just north of my own offices. That makes me hope that the city can take that step: That it can afford to pause, set priorities and deliver them. But I’m concerned about saying that, too. The property has been listed for sale for years; that listing is still online as an active development opportunity in the city. As the economy rebounds, Ypsilanti will be in a better position than it has been in the last five years to find buyers for this property. But will there be potential buyers - for commercial, for residential, for recreation - as the city resets what it wants there? The property has had a vision for years, too. We’ve had council members direct the real estate agents toward density; toward commercial entities; toward generating taxable value. Before that, there were consultants and downtown visioning sessions. I’ve been to at least one Water Street charrette. For more than a decade, everything that some people wanted on this property, others didn’t. The polarization is now paralysis. In the meantime, the debt is real: At this point, a city of 19,435 people owe an amount equal to $1,543 each on the vacant property. What makes sense for Water Street? So far, with the stated goals and subsequent contradictions, the answer may never yield clarity then action. The Ypsilanti community is likely to get exactly what it’s had there for years: Nothing, but with fewer choices. Paula Gardner is editor of AnnArbor.com. Contact her by email or follow her on Twitter. Tue, May 7, 2013 : 2:35 p.m.
Why not sell the property to American Honda so they can build a really nice dealership instead of the long-decaying Honda dealership across the street? Mon, May 6, 2013 : 5:59 p.m.
Mon, May 6, 2013 : 4:21 p.m.
Paula, thank you for thinking about this out loud. Though you deride it as &quot;nothing,&quot; many of Ypsilantiots are beginning to feel that those who are making creative use of those acres—from Teresa Gillotti's City Tree Nursery, to the Free Skool's May Day potluck, to Mark Maynard's seedbombing event—are beginning to draw positive attention to that gorgeous wilderness. Whether or not such creativity will indeed &quot;spark&quot; fruitful development remains to be seen; the point is, however, that while bureaucrats, consultants, and journalists continue to talk and opine, others are out there bringing life to Water Street. Mon, May 6, 2013 : 2:17 p.m.
Mon, May 6, 2013 : 12:34 a.m.
A rec center by the river keeps the natural feature of the river accessible to the community. Plus a rec center could be a great attraction to some Ypsi-living I love the downtown extension along Michigan Ave, with smaller buildings and possibly loft apartments. This includes a small-business-sized rec center access on Michigan Ave. I suppose I could tolerate a Family Dollar if the parking was in the back. An extension of River St. could end at the river until funds were available for a bicycling/pedestrian bridge. No need for cars to cross there. Sun, May 5, 2013 : 10:04 p.m.
Its sad that no one will agree on one idea. The longer we wait the less people will care to try and develope here. I guess the idea here is that nothing is better then anything. Well say hello to our new 30 million dollar park that looks terrible. Sun, May 5, 2013 : 4:42 p.m. I appreciate the thoughtful comments here. I also look forward to Katrease's coverage in the coming days as the city makes a decision on the Family Dollar. I do agree with RUKiddingme that this project raises questions about municipalities getting involved in real estate development. There are a lot of lessons to be learned here, lessons made harder by what happened with the economy. I do recall that it was very difficult for people who were concerned about the financial viability of the project - very early on, before the downturn - to be heard as part of the debate. Sun, May 5, 2013 : 2:53 p.m.
Great piece, great timing, very thoughtful. The unanswerable question: Do we hold out for what the vision is, or has the huge amount of time that has gone by prove that the vision is unrealistic? Sun, May 5, 2013 : 2:24 p.m.
Nice opinion piece. While it briefly touched on the staggering amount of debt that is owed by the taxpayers for decades to come, AA.com would be doing its readers an extraordinary service by expanding on the financial component using two or three development scenarios to make its point. Even if the entire site fully develops (Burger King, Family Dollar, tax-exempt Rec Center, whatever) the revenue generated wouldn't begin to cover the principal and interest owed over the next several decades. While the original 'development plan' created by the city's planning staff and a host of costly consultants may have been well-intended, this is one more example of government getting involved in an area it has no business getting into and no expertise to effectively manage and administer. Planners may be creative, but they don't begin to understand finance, business and real estate markets. Those who suffer the most, of course, are the taxpayers. And, they will be feeling the financial impact of this government-created debacle for decades to come. It is very distasteful to know that our Water Street debt obligation is keeping our police and fire departments from being able to maintain minimum staffing levels required for ensuring adequate public safety. Sun, May 5, 2013 : 3:08 p.m.
TK2013, Stay tuned. We will have a story with more information regarding the Water Street debt soon. Sun, May 5, 2013 : 1:45 p.m. Neither election nor appointment implies any intelligence, skill, or expertise other than being alive, which is something voters should remember and those in office must remember. Sun, May 5, 2013 : 1:32 p.m. The most important thing to take away from this debacle, I think, is that the city should not try to get into projects it has no provable track record in. These people are not real estate developers, just like Ann arbor City Council is not a group of accomploshed artists. It's just a room of 10 - 12 people trying to figure out what to do with the hundreds of millions of dollars they are guaranteed to get every year (you don't pay property tax, you lose your house). They need to focus on the standard core services and continued operation of the city, end of story. Sun, May 5, 2013 : 1:19 p.m. Right on Paula! And then there is dealing out the patchwork at zoning (and our Council) and the micromanaging of it from there. Sun, May 5, 2013 : 1 p.m.
Sun, May 5, 2013 : 1:20 p.m.
sounds good oh...except the zoning and contamination issues...but otherwise, sounds good. Sun, May 5, 2013 : 12:09 p.m.
Sun, May 5, 2013 : 3:06 p.m.
worldchamp, The city officials I've spoken with said they believe the likelihood of having a single developer come in to develop the 38-acre site is unlikely. 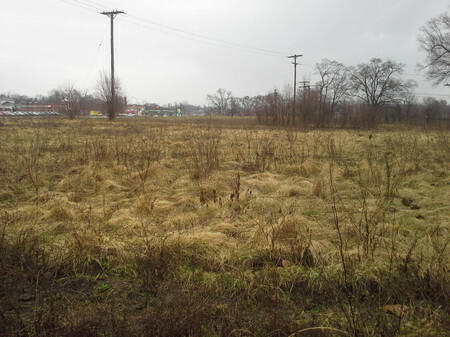 The city decided years ago to break the land into multiple parcels that could be sold to several companies or entities. Although, the city has said if a single developer came along, it would at least consider the proposal and not rule it out completely. Sun, May 5, 2013 : 11:37 a.m. It sounds like the recreation center, proposed by Washtenaw County, isn't certain for the property. One of the most recent stories we had showed that the location of it on Water Street is in question: http://www.annarbor.com/news/ypsilanti/eastside-recreation-center-2015/ But some appear are raising questions about using other property for it, too. The center wouldn't be property tax generating, but when it was proposed, people said it still brought value to the vacant land, since other quality tax-paying entities could be drawn to want to be near it. Sun, May 5, 2013 : 10:42 a.m.
Paula, Thanks for this thoughtful piece -- but I can't puzzle out what the following means: The willingness of Washtenaw County to build a recreation center there as a &quot;first in&quot; project. The rejection of it, as others say it shouldn't be on that property at all or in a prominent spot.